San Franciscans crowd 4th Street and Market Street on Victory Over Japan Day. Overnight the crowd, fueled by liquor and hysteria, would riot, leaving eleven dead, and 1,000 injured. Many of the injuries involved broken limbs and cracked noggins from fights and falls. 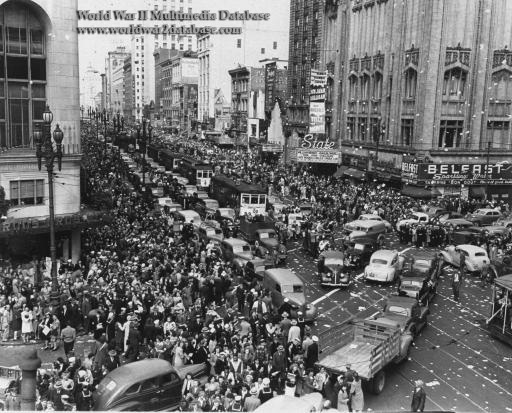 The riot, which followed the Japanese surrender announcement by a day, was mostly confined to downtown San Francisco and involved thousands of drunken soldiers and sailors, most of them teenagers. They smashed store windows, attacked women, halted all traffic, wrecked Municipal streetcars. 30 streetcars were disabled, and one streetcar worker was killed. The rioters took over Market Street and refused to leave until military and civilian police drove them away long after nightfall following hours of chaos. At 11 o'clock that night, the authorities finally moved in on Market Street. The police and military moved up Market, sweeping the rioters before them. Hours later, the rioters dispersed. The State Theatre at 787 Market Street, designed by Alfred Henry Jacobs, closed in 1954.